The biggest difference between my “Pick of the Day” and “Currency Cross-Eyed” is that these will be longer term trade ideas, meaning longer time frames and wider exit strategies, so please adjust your position sizes to keep within your risk management rules. Other than that, everything else will be pretty similar – enter and exit strategies, trade management rules, etc. Right now I am Eyeing EUR/CHF. 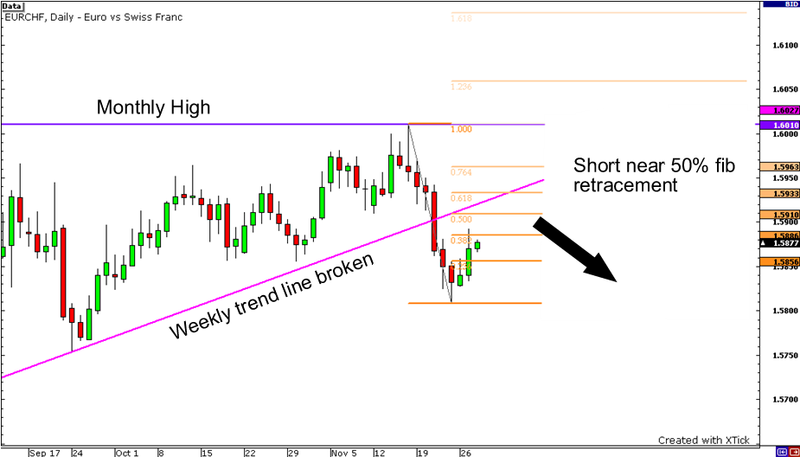 If you take a look at the chart, you can see the pair has been on an uptrend, but it looks like the pair has failed to rally above 1.6000, and now it has broke below the pink weekly trendline. Now, the Euro has been on a tear against USD, but it looks to be in an overextended buying frenzy. A correction on profit taking will affect EUR/CHF, which is why another reason i’m looking to short this pair. A short at the 50% retracement line at 1.5910 is what I will be waiting for, but if the pair goes lower from here then a short at 1.5850 looks good as well. For now, no specific trade idea as we wait for conformation of which way this pair will move. So, stay tuned!